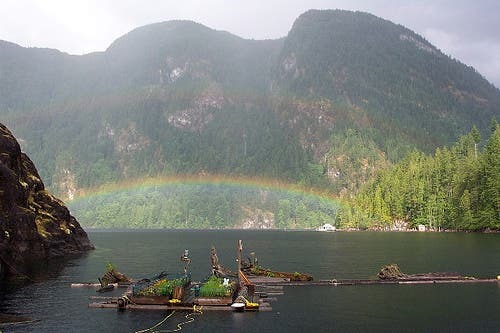 My husband Wayne and I were vacationing in Coastal British Columbia when we discovered something unique and intriguing on Powell Lake, float cabins. It was love at first sight. We had been looking for a place to retire and knew this was it. We laughingly say, when we bought our cabin, it came with John. This was very important. In the beginning we could only visit on holidays. John (the previous owner and cabin builder) agreed to check on our place and help out with odd jobs. Float cabins are a big part of Coastal BC history. During the heyday of logging and fishing, they were used as support camps that could be moved from place to place. 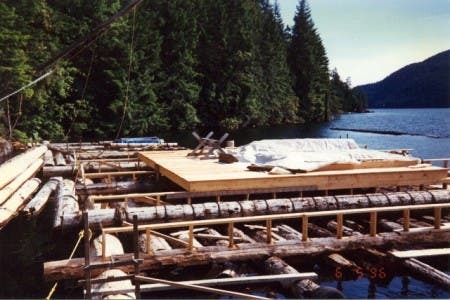 On Powell Lake, float cabins were inexpensive hunting and fishing getaways for paper mill workers. Today things are a little more regulated. Cabins have registered water leases and we pay property taxes. Cabin construction begins with the float. John lashed huge cedar logs together with ¾ inch steel cable. A winch and hydraulic jack tighten the cables and large railroad spikes hold them in place. Next the deck is added and finally the cabin is built on top. John is typical of many people who live in Coastal BC. He is self-reliant and a “Jack of all trades.” And he has been very patient about teaching us “city-folk” along the way. Our cabin is small (20×21 feet) but complete. The downstairs has two bedrooms, one of which we use for storage and a bathtub. The main downstairs area is a great room design including kitchen, dining and living areas. The large upstairs loft is our bedroom. It’s plenty of space, especially since we have the whole outdoors at our doorstep. 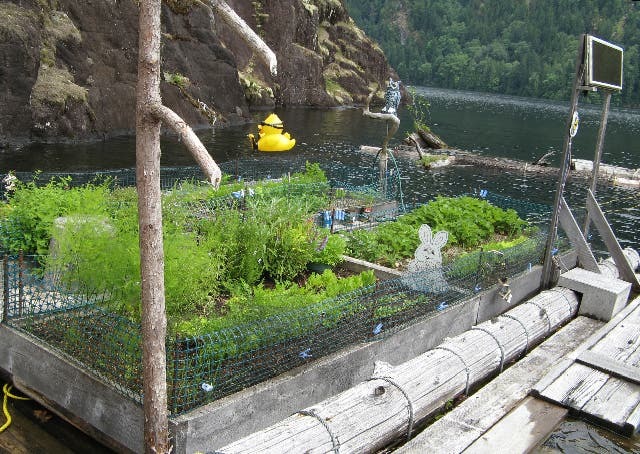 The main float is 40X40 and we have additional floats for a variety of purposes: a dock, a floating woodshed and my floating vegetable garden. The garden is on a pulley. 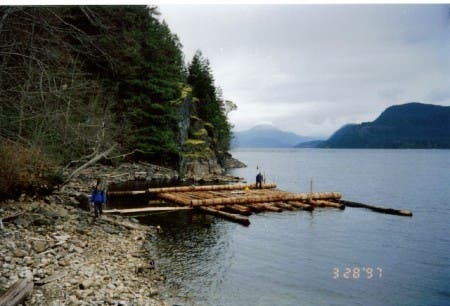 I bring it in to tend my plants and then send it out to our log boom breakwater to protect it from hungry critters. When Wayne wants privacy for writing, he heads out to the Gemini, a renovated boat that is his author’s retreat. We live up the lake about 25 minutes from the marina. Our power sources are solar and wind, with propane for cooking, refrigeration and additional lights. In winter we use a small generator to give our batteries an occasional boost. Our wood stove keeps the cabin warm so we can live there in all seasons. An outhouse on shore may soon be replaced with a composting toilet. Four flights of stairs up the cliff in stormy weather isn’t always fun. Now that we have retired, we spend about 75% of the year living in our float cabin. Our lives follow the seasons with wood gathering, gardening, swimming, fishing and enjoying our surroundings. There’s nothing better than getting up early and having a cup of coffee on the deck watching the sun rise over Goat Island to herald in a new day. 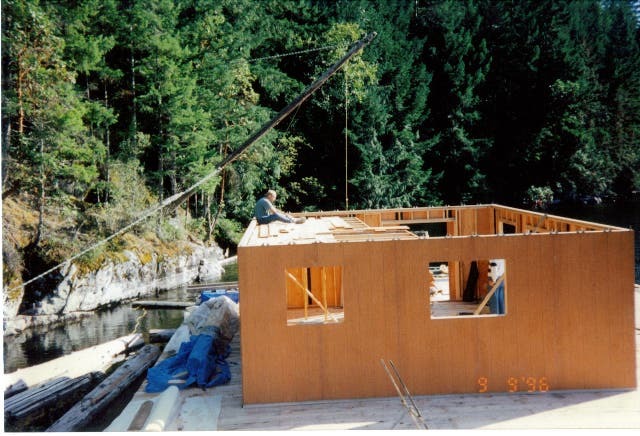 In 2001 we purchased our cabin for $35,000 CAD which at the time was about $25,000 USD. We figured we couldn’t go wrong with that. Actually, because there is a moratorium on new cabins the values have risen quite rapidly. 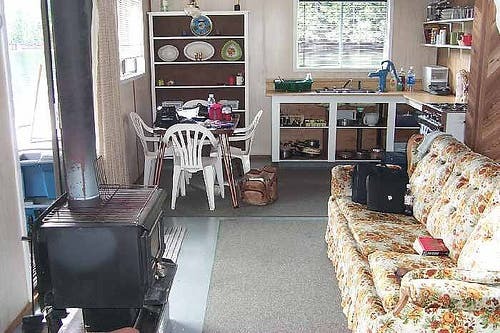 John sold another cabin this year (a little larger than ours) for $100,000 and some are going for even more than that. Even so, it is still within the range of many people. Of course, that is because there is no land involved. But we feel comfortable with our 20 year lease that is renewable from the BC government. The lease payment is $500 a year and the taxes the same amount. 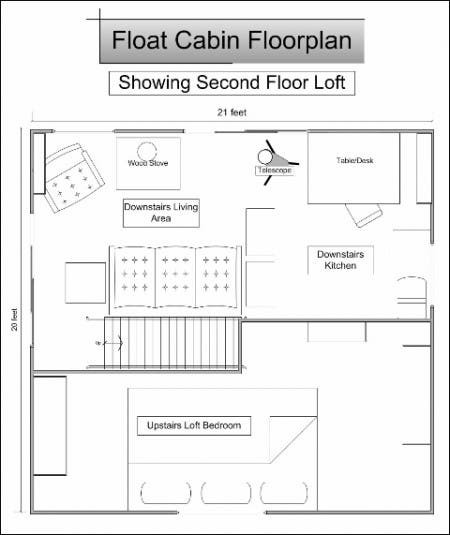 You can find more information about float cabin and off the grid living at http://PowellRiverBooks.blogspot.com. For information about Wayne’s Coastal BC Stories, come to www.PowellRiverBooks.com. Up the Lake and Farther Up the Lake have lots of information about our cabin life on Powell Lake. Thanks for writing about your cabin Margy! I noticed it on the Small Cabin forum right away because of the beautiful location. Also, thanks for your great blog and your podcasts, too! I think it’d be very peaceful living there, surrounded by a lot of natural beauty and soothing streaming water. My question, though, is more about conservation. One home on the lake – no big deal. It’s beautiful to see and offers a unique perspective in living. If hundreds of thousands of homes are built like this, we may just end up polluting rivers and streams. I don’t know about other lakes or rivers, but on Powell Lake. I agree with you, it wouldn’t work everywhere. 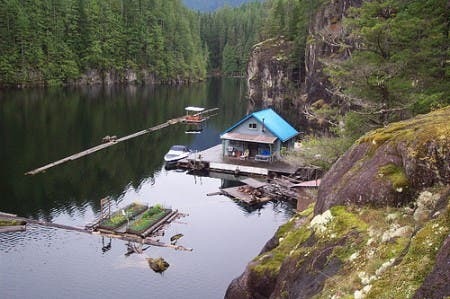 Here on Powell Lake there is a moratorium on the number of cabins. In about 1998 the number was capped at 250. That probably sounds like a lot, but our lake is 51 km long with over 480 km (300 mi) of shoreline. It is also over 1000 feet deep in places due to its glacial origin. There’s even trapped sea water at the bottom. Cabin owners like privacy, so they have placed their cabins with good spacing from neighbors, and the natural bays needed for protection from wind and waves also helps to keep things separated. There are lease restrictions about the handling of waste water to minimize pollution. Som of the larger bays with several cabins have their water tested on occasion to make sure everything is OK.
Aother factor is that most people only use their cabins in the summer and a few sunny weekends during other times of the year. We are an exception staying for most of the year. I agree with you about pollution. We are extremely careful about what goes into the lake. My gardening is organic, no pesticides. We drink the lake water (after boiling) so we have a vested interest in keeping the water pure. This is beautiful! What a pretty spot you have. And I loooove the garden! Thanks for the question Bry. As I mentioned in the post we currently have an outhouse on shore. But it is on the cliff so it requires a climb. We use what we lovingly call “Mr. Pee Bucket” to reduce the number of daily trips and haul it up the hill at a later time. I just found your site, its great! I thought I had seen everything, but never this. What could be better than living right on the lake? YOU HAVE A BEAUTIFUL SPOT. HOW FAR UP THE LAKE ARE YOU?? sorry caps was on. we have a cabbin up there too. we use it mainly for summer we chare with 2 other families , we have an in sane number of kids all totaled (15)and they love it up there in the sun cheap vacationing fro those of us with tight budgets. we are the 5th up from haywire bay. we just recently rebuild becasue the origional cabin was mouse infested and pulling apart the float had issues. 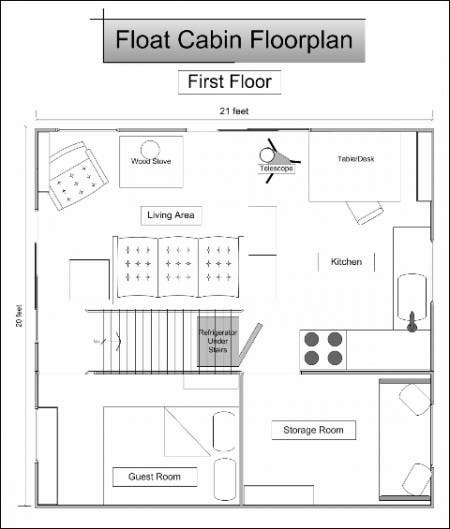 but now we have a lovely 3 bed room 24×24 cabin with a large deck out front. we just installed a woodstove so we have winter use too. if it wasn’t fro all the kids i’d so love to stay up for longer , maybe this winter break. though going through one summer storm was a bit u nerving, yet cool allt he same, the rain on the tin roof was soo cool. i love your floating garden. do you have some sort of system to wick water into the beds so the plants don’t need to be watered from above?? such a great idea! any way love your home.. it is paradiseacle.. and yes we live in one of the most beatiful places ! Hello Margy: By accident, I found your blog. I simply adore the photographs of your cabin on the water. A big wave from the other side of Canada on January 1, 2009, where we have been struck by a bad snow storm. I am looking to build something similiar on a property that I recently purchased (6 acre pond). It’s very remote and private. Congratulations on a wonderful house! Beautiful location, lovely project, good use of materials. But where’s the bathroom/toilet? What a perfect location. I could do this even if I had to hike to the toidee. Never fear, we just added a small bathroom including a composting toilet. Now we only have to climb the hill to the outhouse if we want a better view during our contemplation time. Love it! The most beautiful location in the world. Greetings, Margy. “A cabin on a lake”? How Canadian! 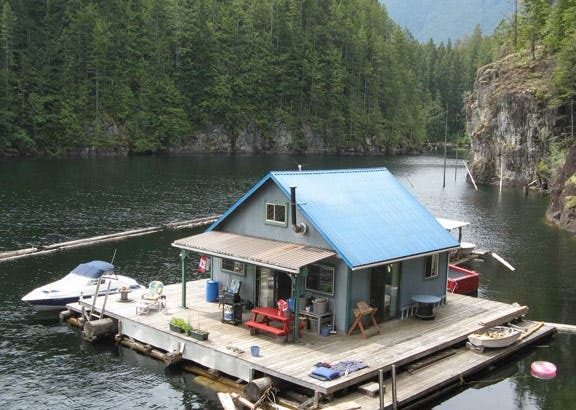 Ah, but a cabin right on a lake…That really is innovative thinking! With minimal effort you could change your views by re-orienting your home or towing it to a new lease. What a beautiful place to live. I think we’ll sell the trawler and build a little place on the water.. Indeed a beautiful home, I cannot help but feel envious. You spend all of your life chasseing the almighty dollar, up early to bed late, avoid the need to look after your health for the green back only to find when you wake up one morning your health gone and now you spend all your money to try and get your health back, and it’s all for not. What a sad day indeed. Please drop me a line I need to ask you a few more questions.